This is a recipe from my girlfriend's blog (she writes in Catalan, you can check her post here). We love artichokes, and this recipe makes them very tasty. If you enjoy artichokes, give it a try now they are in season. Slice your lemons in half and throw a little lemon juice in a cup, mix it with 4 tablespoons melted butter. Set aside. In a big pot, pour the broth, thyme, laurel, garlic, wine a shot of olive oil and 3 lemon halves. Let it cook very slowly. Clean the artichokes and remove the leaves from the bottom. 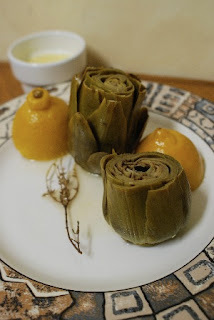 Cut the ends of the artichoke leaves and rub the remaining half lemon on them. Give a taste to the lemon broth, add salt and pepper to suit your tastes. Put the artichokes upside down in the pot (with the base pointing up) and cook for around 30 minutes, with the pot closed. They will be ready when they are soft when pricked with a fork in the base. Serve with a cup with the melted butter we separated before, to dip the artichoke leaves in. If you like, you can add a little cumin or cilantro to the butter mix.